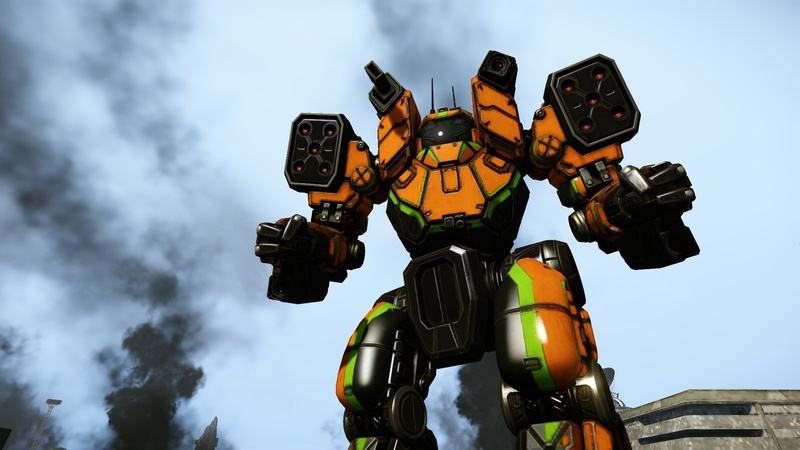 Zeus - Tankiest assault in MWO? I've been playing this little nasty thing for the last two days and as I elite them one by one, I'm getting a good feeling of their capabilities. I just wanted to share my thoughts before I delve into mastering them and start pushing their limits. First of all, this thing is a fantastic tanker. It's an absolute nightmare to kill and it's very forgiving of piloting mistakes. The legs are the biggest weakness of the lights but the ACH legs can survive so much punishment that if an IS light attempts to initiate a "legging war", they're most certainly going to lose. Secondly, the CT is hard to hit for many. Most of the time your arms, side torsos and legs tank the damage while leaving your CT intact. This is why the ACH is so hard to kill, you essentially have to peel off this 'Mech until it gives up. I can face-tank heavies, assaults and absolutely stand on even ground against other mediums and lights. Secondly, firepower. I haven't used Clan ERSLs and SPLs much, but on this 'Mech I can feel their power. The Clan ERSL is essentially an IS ML for half the tonnage while the SPL is roughly equivalent to IS MPLs. You can comfortably boat 6 of these which is simply crazy firepower for a 140 KPH and 6xJJ light. The ACH also comes with an XL240 which gives you 9 true DHS and that helps a ton with heat management, unlike the MLX with its only 7 true DHS. Thirdly, tactical possibilities. This 'Mech, when played right, is an absolute pest. It reminds me of the SDR-5D of 2 years ago, a slippery hunter-killer that lurks behind the enemy lines and wreaks havoc. You can rush immediately for the enemy spawns at the beginning of the match, find a slow assault left behind, murder it and then disappear for a few minutes only to return and pick up a wounded enemy 'Mech again. When caught, you can fight against multiple opponents. I'm not going to call ACH OP though. It's much better than the old top dogs, but frankly this is how the lights should be. They should be horrifyingly effective against slow targets and should have a good amount of bite for their size. The best IS lights didn't have much trouble in the firepower department, but their relative fragility (due to weak legs, mandatory XL and bad hitboxes) also kept them from dominating. I really hope PGI considers buffing their survivability to at least ACH levels to compensate. I think this will be my next review 'Mech, I can't wait to play with elite efficiencies and see what they can really do! I'm an engineer who likes to write extremely long articles about games that border simulation and mainstream. © 2015 Rak's Armory. Powered by Blogger. The Orion — "Balls or amazeballs"? Rak's Comments — Cost effective XL engine? Copyright © 2015 Rak's Armory.